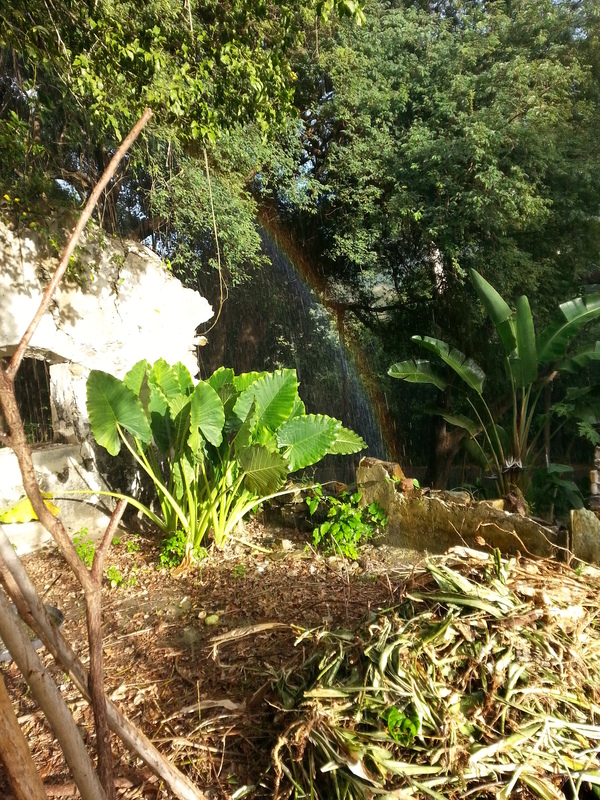 Our own private mini-rainbow in the garden! It’s been less than two weeks since I came “home” to St Croix, and much has already been accomplished. I have found a building site for my tiny house, cleared said site, and now re-filled the clearing with a huge mess of branches ensnared in a variety of vines which had to be trimmed from above the site. Soon those too shall be gone, and the digging of the foundation may commence. 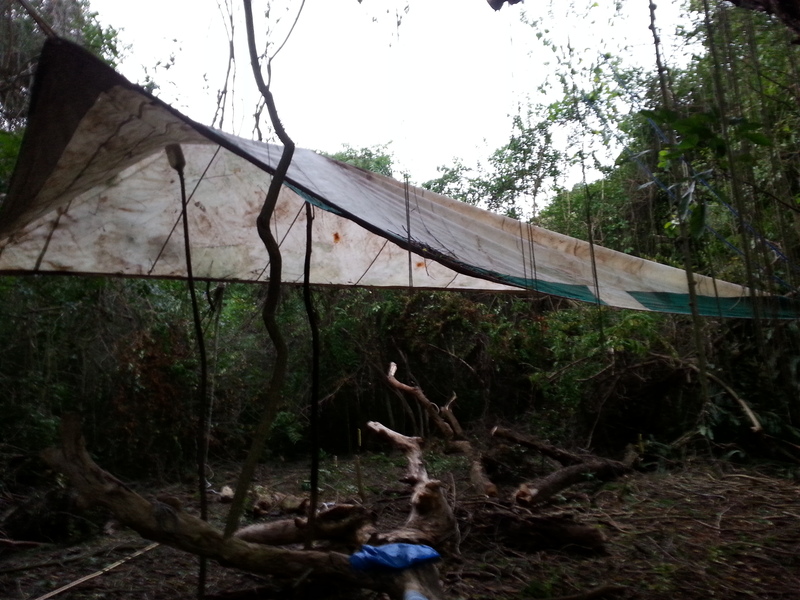 An old sail has been set up for shade, and I am mentally preparing myself for chainsawing large fallen branches, seemingly a good way to familiarize myself with our chainsaw before I try to do anything too precise with it. 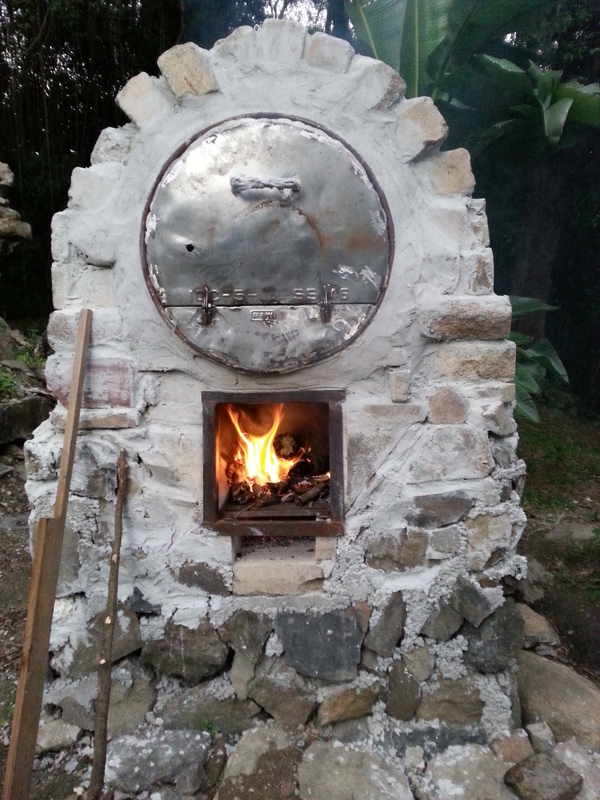 The wood-fired barrel oven that Mandy and Jan built before I arrived has now been heated for the first time…and the second time! 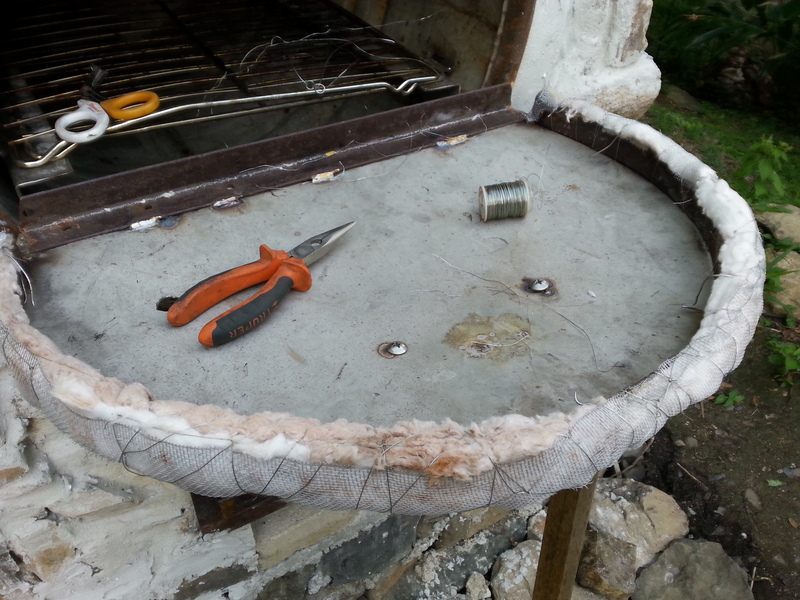 Before trying it out I had to make a seal for the door, from kiln insulation wrapped with mesh and wire, and then I got to build a big fire and see how it works! The first attempt brought the oven up to 325F with a moderate fire; the goal is 450F, for the proper crust to form on my sourdough breads. The general conclusion from the “test” heating was that the door may need a layer of insulation on the inside, and that the fire chamber, currently open, may require a door to impede the airflow and thereby slow the burning of the wood whilst also trapping more heat within. With a little fine-tuning and experimentation I should soon be able to bake large batches of sourdough bread in it, to feed all you hungry people! For the second heating we’d added a layer of sand in the bottom of the cooking chamber, and a makeshift door to the firebox, but for whatever reason did not achieve a temperature over about 300deg F. More on that later, as we figure out what we’re doing wrong – it could be the chimney, or the lower airflow, or many other factors. Insulating around the oven door. 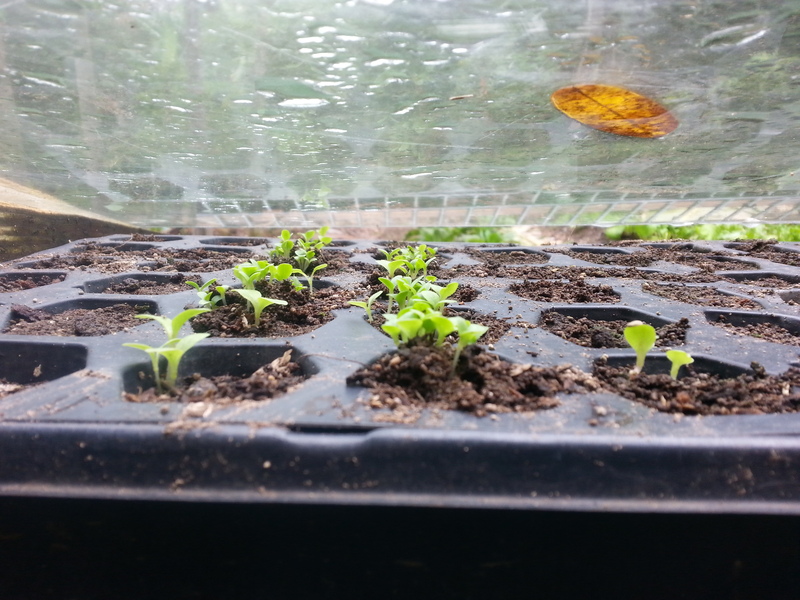 We’ve had a good bout of rain, daily for the past 4 or 5 days, which is sending the garden into copious production of everything, with more seedlings to be planted out next week to fill in any gaps. A good amount of mulching with tree bark (from dead, cut trees and logs) around our tomato beds seems to be keeping them from drying out as much in the hot afternoon sun; always a killer here. Currently we have about six varieties of greens, basil, oregano, tomatoes (not quite ripe), green beans, peppers, seasoning peppers, parsley, and (very small) mint producing, along with papayas, sour oranges, and bananas. We’re anxiously watching for flowers on the mango and avocado trees, and hoping that the heavy rains don’t damage all the flowers, preventing a good crop! Only 3 days after planting the seeds! In regard to the Tiny House – nicknamed the “Nid” by my granddad – it’s plans continue to evolve slightly as time passes. The floor plan remains the same, but trimming the saman tree above the site has yielded some handy pieces of wood for massive posts, and Jan (my mother’s partner) and I have been tossing around ideas for round and elliptical windows. These might have bars or security screen built in, with an eyebrow above meaning that they could stay open in all except a raging storm. This idea was perhaps fueled by an entire day spent wrestling with the installation of burglar bars into the windows of our “cottage”, the rental unit on the property. Details details. Once the foundation is dug and built the Nid will start to rise from the ground, doubtless changing as it rises, a phoenix of wood and cement. Next up will be posts on making fresh coconut milk by hand, using the wood-fired bread oven, and digging the Nid foundation! Cheers for now!